Recently, you may have seen news stories claiming that tourists could “face the death penalty” for taking selfies on a certain beach in Thailand—which we can all agree is a little bit extreme. Thankfully, those claims are totally fake. 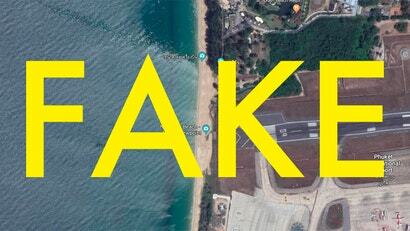 This week, a flurry of fear-mongering reports came out warning that taking a photo on Mai Khao beach near the Phuket airport in Thailand could lead to capital punishment. The area is a popular locale for viral snapshots, and authorities have indeed said they plan to create an off-limits “safety zone” near the runaway—but no one is threatening death. As Phuket newspaper the Thaiger first noted, all these stories seem to be taking a quote from from an airport official out of context. In a story about the safety zone published by the Bangkok Post last month, deputy Phuket airport chief Wichit Kaewsaithiam additionally warned people against flying drones near the airport or shining lasers at planes, potential violations of Thailand’s Air Navigation Act. “The maximum penalty is the death sentence,” Kaeothaithiam said, clearly referring to violations of the Air Navigation Act—not selfie crimes. When it comes to tourists, the new policy is more measured. According to the Thaiger, authorities plan on restricting public access to further down the shore. At some point, it appears that Western news outlets conflated the two warnings, falsely believing that entering the proposed safety area—not violating the Air Navigation Act—could result in the death penalty. The Thaiger took particular offence at the confusion.